Mexico drug cartels extend reach in U.S.
A Mexican soldier guards 12 tons of marijuana in Tijuana, Baja California state, Mexico, in February. Washington (CNN) -- The availability of illegal drugs is increasing in the United States -- fueled largely by expanding activity from Mexican drug cartels -- and abuse of controlled prescription drugs is getting worse, according to the National Drug Threat Assessment 2010 report, released Thursday. "The trafficking and abuse of drugs affects everyone," said Michael T. Walther, director of the Justice Department's National Drug Intelligence Center, which produced the report. "The economic cost alone is estimated at nearly $215 billion annually." The Mexican cartels, the report says, are "the single greatest drug trafficking threat to the United States." The Mexican organizations have operations in every region of the United States and are expanding into more rural and suburban areas. They've also stepped up cooperation with U.S. street and prison gangs for distribution. With drug violence on a frightening rise along the Mexican border, the assessment found greater levels of heroin, marijuana and methamphetamine flowing across the border than ever before -- and predicts more to come. That increased traffic, the report suggests, is partly to blame for a rise in the purity of heroin and a drop in its price, along with an increase in overdoses and overdose deaths. Government officials, in fact, estimate that heroin production in Mexico jumped from 17 metric tons in 2007 to 38 tons in 2008. The report's authors credited the Mexican government with moving to ban the importation of certain chemicals used to produce methamphetamine, but notes the cartels have found substitutes. Earlier this week, Secretary of State Hillary Clinton traveled to Mexico with other high-level administration officials to discuss the Merida Initiative, a multi-year, $1.4 billion project aimed at helping Mexico combat organized crime. Clinton said the initiative would emphasize social and economic development in addition to security. Mexican police announced Thursday the arrest of a suspected drug kingpin they believe is a major supplier of heroin to the United States. Jose Antonio Medina Reguin, known as the "King of Heroin" or "Don Pepe," is suspected of smuggling up to 200 kilograms (441 pounds) of heroin into the United States each month, netting him up to $12 million monthly, federal police said at a news conference. 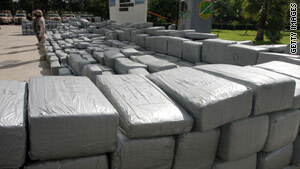 Illegal drugs are crossing America's other large border as well, the report says. Asian criminal organizations manufacture the drug MDMA, more commonly known as ecstasy, in Canada and smuggle it into the United States. MDMA is also smuggled into the United States over the southwest border via commercial air, the report said, and its distributors are finding more users in the African-American and Hispanic communities. Cocaine, on the other hand, remains in short supply in the United States, a trend that began in 2007. Officials attribute that to decreased cocaine production in Colombia, a high number of cocaine seizures and a high worldwide demand, especially in European countries. While the use and abuse of illegal drugs is of great concern, the abuse of prescription drugs is rapidly becoming more alarming, said the report, which also said that more state and local law enforcement groups identify prescription drug abuse as their top worry. Video: Mexico's drugs: U.S. to blame? Increased abuse of prescription opioids such as morphine, codeine and methadone sparked a 98 percent rise in overdose deaths between 2002 and 2006, the report said. "The 2010 National Drug Threat Assessment highlights diversion and abuse of prescription drugs as a serious and increasing problem," said Gil Kerlikowske, the director of the National Drug Control Policy. Kerlikowske said the Obama administration has "developed a plan to curb prescription drug abuse, which includes expanding prescription drug monitoring programs and educating healthcare providers and patients about the danger of abusing prescription drugs." "This report presents a comprehensive analysis of the drug threat to our nation and will be valuable in helping direct our fight against drug trafficking and abuse," said Attorney General Eric Holder.